On the same day we ate the notorious Lechon Pizza from Pizza Hut, me and my friends continued on and had dinner at Kanin Club with a larger company. I’ve heard plenty of positive feedback from this place, but was never inclined to try it because of the first word. I’m not a rice lover, period. Because of the name, I expected rice to be the specialty. However, a friend insists that the Crispy Dinuguan here is a must try. And because it was a pretty large company, I decided to tag along. I find out that it’s a Filipino restaurant. As such, I expected that this is a great place for large parties. There were ten of us when we went in. Their menu is filled with typical Pinoy favorites, usually with some sort of twist, and plenty of variations of rice from plain to brown to chorizo to insert-Filipino-style-of-cooking-rice-here. I eyed a couple of dishes that I wanted to try out. 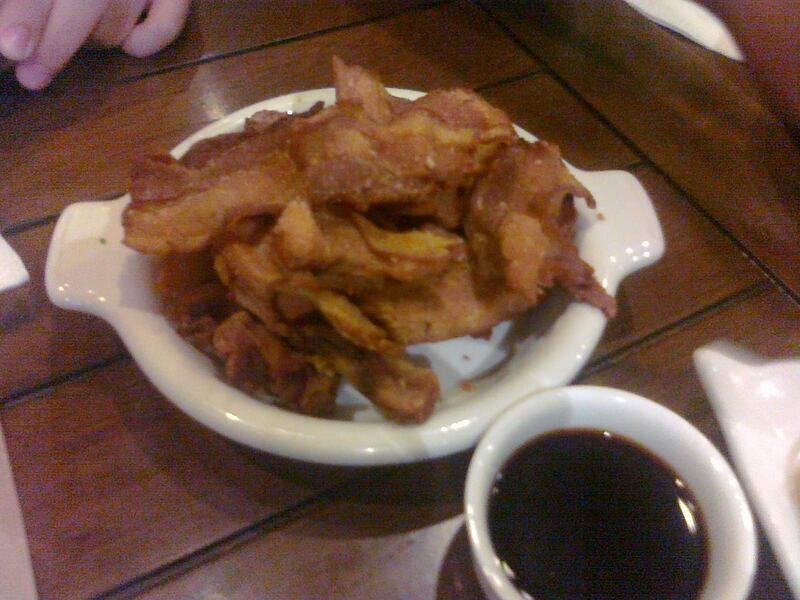 So I ordered their Crispy Liempo (142 Php), which was listed as an appetizer. I also asked for their Adobong Kangkong (97 Php) because the idea of eating a Double Down for breakfast, Lechon Pizza for lunch, and another pork dish for dinner sounds like it would kill me in my sleep. 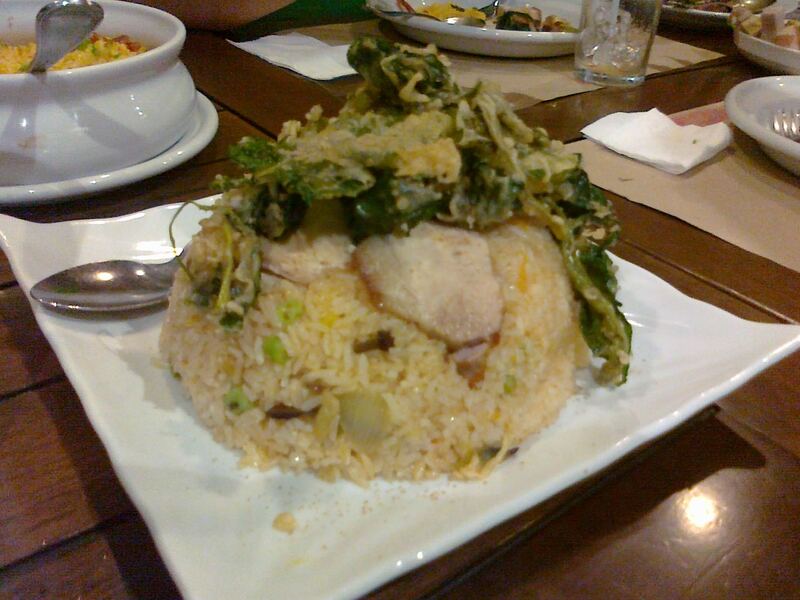 Finally me and a friend shared an order of Sinigang Rice (224 Php), apparently good for 2-3. To say that the Sinigang Rice is good for only 3 people is an understatement. It could’ve made four people full easily. Because we shared amongst ourselves our orders, everyone managed a taste. It had mixed vegetable tempura and slices of pork belly embedded within, making it a meal on its own. As for it taste, it tasted surprisingly similar to sinigang, or the sour tamarind stew Filipinos enjoy. I’ll admit that if I had a choice, I steer clear of the said soup because sour is my least favorite of the five tastes, but this one’s pretty good. Each bite is like having a sip of sinigang, except you’re having it in solid form. When the Crispy Liempo arrived, I had a huge smile on my face. It looked like bacon. It tasted like bacon. Most importantly, it was very crispy that each bite sounded like a sin. Just look at it—do I need to say more? I didn’t manage to get a picture of the Adobong Kangkong, but it was very good, crunchy with the salty-sweet and slightly sour flavor. It was also presented prettily, like a salad you’ll get from classy restos. 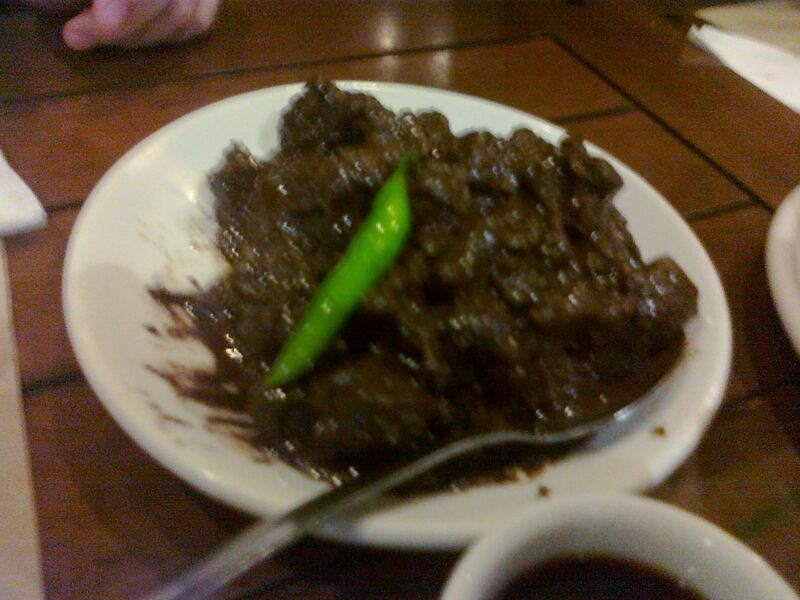 However, I did manage to snap a shot of the Crispy Dinuguan, pictured above. It became my favorite dish of the night next to the Crispy Liempo. I usually don’t like dinuguan, which is basically pork blood stew, maybe because of the soft texture of the pork it usually comes with. I have no problems with the taste of blood, though. This one eliminates my problem with the texture as it was as crispy as advertised. These items weren’t the only dishes I got to try. My friends also ordered stuffed squid, tokwa’t baboy, chorizo rice, and some other dishes that escapes me right now. I do recall that all of them were excellent. Kanin Club instantly becomes my favorite Filipino restaurant, especially with favorable prices. We only paid 2,800 Php split among 10 people. With plenty of variety and delicious dishes, it was a great deal. When you’re with a large company, Kanin Club should be among your top choices to go to. Recommended for: Party of at least 4 Filipino food lovers. Smart nomnomnom tip: The more the merrier applies here the most over any other restaurant I’ve tried.